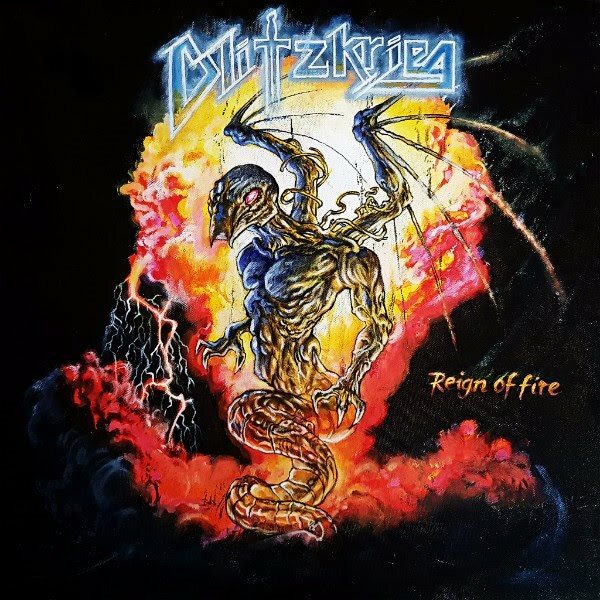 NWOBHM (New Wave Of British Heavy Metal) veterans BLITZKRIEG will release a new seven-inch vinyl EP, “Reign Of Fire”, on December 8 in a limited edition of five hundred copies embraced by amazing handdrawn old-school metal artwork by Lee Murphy. “Reign Of Fire” was recorded by Phil (Vandetta) Davies at Downcast Base HQ Recording Studios, Newcastle upon Tyne, England and mixed by Johan Haagesen at Hansen Studios, Ribe, Denmark. 2015 marked the thirty-fifth anniversary of BLITZKRIEG, which came into existence in 1980. Although their debut single, “Buried Alive” b/w “Blitzkrieg” (on Neat Records) was released in 1981, it was not till 1985 that the band recorded its debut album, as Ross was involved with his other group, SATAN, recording and touring their debut opus, “Court In The Act”. BLITZKRIEG‘s “A Time Of Changes” included the band’s self-titled song “Blitzkrieg”, which was covered by METALLICA on the “Creeping Death” EP. METALLICA‘s drummer, Lars Ulrich, commented that BLITZKRIEG was one of his band’s main musical inspirations, along with DIAMOND HEAD. Brian, the only remaining founding member of BLITZKRIEG, said: “Lars Ulrich phoned me up and asked if they could cover the song. Brian said that he tried to give the then-unknown METALLICA a helping hand in the early 1980s. “They sent me their demo when they were still unsigned, asking for my help to get them on our label,” he said. “But the label turned them down, saying they’d never go anywhere.